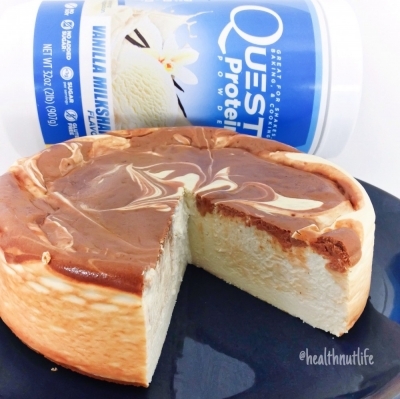 A protein packed cheesecake with a cookie dough swirl. 1. Preheat the oven to 325 degrees Fahrenheit and prepare a spring-form pan with either parchment paper or non-stick cooking spray. 2. Mix the fat free cream cheese and the stevia together with a hand mixer until smooth. 3. Add in the eggs one at a time and mix after each one. 4. Add the rest of the ingredients, except for the Quest Bars and 1/4 cup milk. 5. Microwave the Quest Bars and milk for a little less than a minute and then mix to melt it to a smooth consistency. 6. Put some of the cheesecake batter into the melted Quest Bars until smooth. 7. Put the rest of the cheesecake mix into the prepared spring-form pan and flatten with spoon. 8. Add dollops of the chocolate chip cookie dough batter and make swirls into the cheesecake. 9. Bake in the oven for 30 minutes then reduce the heat of the oven to 200 degrees Fahrenheit. 10. Bake in the oven for an additional hour. 11. Remove and let cool completely on the stove top. 12. Let it cool in the fridge overnight or at a minimum of four hours and then enjoy!